"This fun story (Harcourt 2003), written and illustrated by Marla Frazee, tells the story of a young girl's first ride on a roller coaster. She waits in line for the coaster with her father, eventually takes her seat, and hangs on as it climbs up the hill. Terrified at first, the girl quickly realizes how much fun she is having. When the ride is over, she's ready to go again! The Vibrant watercolor illustrations perfectly capture the different emotions on the faces of the riders. Amy Rubinate's incredibly expressive reading reflects the hesitation the child feels at the beginning of the ride and then the sound of sheer joy as the roller coaster zooms, zips, and loops the loop! Wonderful sound effects include carnival music, the whooshing noise of a roller coaster, and the whoops and hollers of the riders. Page-turn signals optional. Children will be delighted." 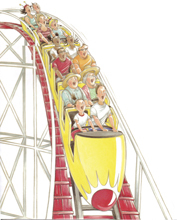 "Frazee’s splendorous ode to a young girl’s first roller-coaster ride with her father is a multisensory delight in this lighthearted read-along (the price includes a hardcover book and CD) that pulls listeners into the bustling action. In a youthful voice, Rubinate reads the text, including amusement-park signs depicted in graphite-and-watercolor illustrations. Sound effects, such as clicking cameras and laughing girls, coupled with musical accompaniment, make this a joyful ride. Suspense is heightened as music rises and falls to match the speeding roller-coaster cars, and then dramatically pauses right before the whoosh of the cars’ descent. Rubinate’s childlike outburst of “all the way around” at a pinnacle moment adds further emotion to the well-expressed feelings of fear, excitement, terror, and uninhibited joy. Frazee’s illustrations and story combine with Rubinate’s childlike reading for a memorable aural and visual experience." "Amy Rubinate takes ROLLER COASTER to new heights. From the very first moment of waiting in line for a ride to the height check to the decision to ride or not-even at the last minute-to the ride's bell starting ring to being pulled clickity-clackity up the hill to the glorious moment at the crest . . . Rubinate IS that rider. Her voice resonates with nervousness but then lets out squeals and giggles as the ride zooms, zips, dips, and dives. Rubinate quiets as the roller coaster slows, and she leaves a long pause as the ride ends. A background soundtrack of a roller coaster park complements the story."